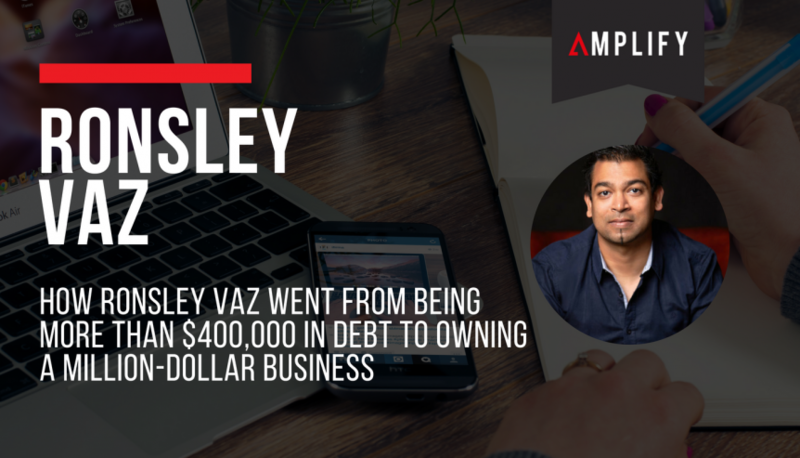 You might have heard about Ronsley Vaz, but do you know his story? Ronsley has had a long and strange journey to where he is now as CEO of Amplify, host of Should I Start a Podcast & Bond Appetit podcasts as well as founder of the We Are Podcast conference. A trained software engineer by trade, he did not start his career planning to be an entrepreneur. In the beginning, Ronsley had some impressive work with the Canadian stock exchange and was a financial advisor for two years, but he wasn’t completely thrilled with his life. So he did what most rational people do in that situation: he opened a restaurant. The restaurant, by many measures, was a success. There were queues out the door and the food had a great reputation. But a lack of business experience financially crippled the restaurant, and Ronsley ended up with more than $400,000 in debt. So, with not much more to lose, he became an entrepreneur. After starting a business called Bond Appetit, a service where clients hired personal chefs to come and cook custom meals for them, he soon moved into the podcast game, starting a podcast to promote Bond Appetit itself. With a rejuvenated thirst for entrepreneurialism and a newfound love for podcasts, Ronsley then started Amplify, the world’s first audio marketing agency. But it wasn’t Amplify at the time. In fact, Amplify didn’t have its name for its first eight clients. It wasn’t until a client called him up to ask the name of the business so that he could refer Ronsley to a friend that Ronsley had to dig deep and come up with a name. Ronsley’s initial business strategy was simple, but effective. He found 10 founding clients, and told them that he would give them an incredible rate for content marketing, as long as they were willing to work with someone who was relatively inexperienced in the industry. He quickly found these clients, began building trust and confidence in his brand, and before a year the business was worth a million dollars. What is Ronsley’s advice for up-and-coming businesses? Content is key. We live in a world where, if you’re not engaging people quickly and effectively, you are going to be forgotten. Content should, in Ronsley’s opinion, always leave the consumer better off then they were before they found the article, podcast, video or whatever it may be. Sure, you might be putting out several blog posts a week, but are they really engaging the consumer? Are they making that person think differently? Or is it just filler content? Conversion isn’t just about convincing someone to buy your product. Conversion means you win them over by providing a positive change to their life. There is something around 2 million blog posts every day. Don’t be a part of the pack that is just putting more meaningless words into the atmosphere. Do something different; be bold. Amplify yourself.